Ah, weather forecasts — sometimes they’re correct, sometimes they’re, well — not very accurate at all! But how can we blame weather forecasters? Even with the advanced computers, weather forecasting technology, and weather observatories that we have today, it’s still not enough to predict the unpredictable phenomena bestowed upon us by Mother Nature. 7-day forecasts are an area where meteorologists have trouble getting things right — especially beyond the 3rd or 4th day of the forecast. Temperatures and rainfall chances that are predicted in 7-day forecasts almost always have to be corrected later on. 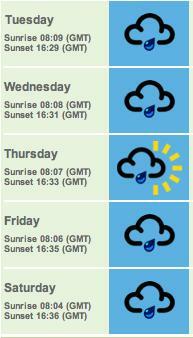 It’s difficult enough to accurately predict if it will rain tomorrow, let alone next week! See why weather forecasts are often wrong (according to a meteorologist). Hurricanes are another area where meteorologists are trying to do a better job of forecasting. While hurricane forecasts are much more accurate today than they were in the 1970s and 1980s, there are still many fairly recent instances where weather forecasters simply couldn’t predict with much certainty what was going to happen come hurricane season. Never was this more evident than in 2006 when hurricane predictions were way off. Check out this case study in weather forecast accuracy. 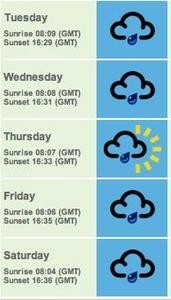 Fortunately, weather forecasting will continue to improve. But it will take many more years and much more advanced technology to make weather forecasts that are 100% accurate. Here’s an example of improved weather forecasting: Weather Trends 360. The technology is delivered by Forbes winner Weather Trends International. For over a decade, they have been pushing the envelope on what people believe is possible about future weather forecasting. Now you can see what the weather is expected to be like over the next 360 days… all over the globe! They deliver long range weather forecasts that are better than “averages.” This information will help you plan — around the weather — a little bit better.